The East Coast recently suffered the affects of Hurricane Sandy, some places more than others, New York City, New Jersey coast line and Long Island were greatly affected. In addition, to donating money to various relief funds you can send those victims a beautiful flower arrangement to let them know you are thinking of them. Clifford’s Flowers has partnered with the FTD creating the Color Your Day Collection, giving a meaning and significance to the flowers sent. 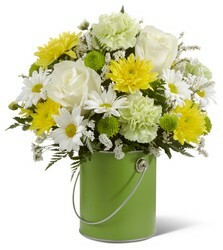 The flowers below are few of the many options available, visit our website for prices and descriptions. 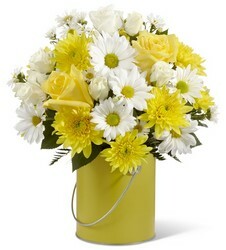 Clifford’s Flowers is proud to announce that we have recently partnered up with FTD and their “Color Your Day Collection.” The Color Your Day Collection offers beautiful bouquets of flowers displayed in a paint can inspired vases. This collection offers 4 different paint can colors to choose from and each color has its own special meaning. These are great great gifts for friends or family members that need a certain little pick-me-up with a special message. 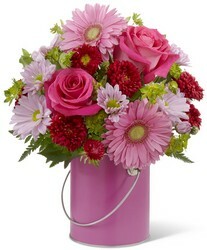 These beautiful arrangements are listed for $39.99, $49.99 & $59.99 on our website or you can click on the image below to take you right to the page! 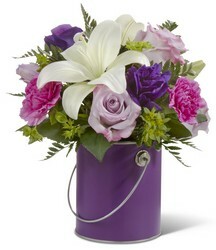 Purple — Color your day with beauty – showcases various hues of purple to trigger the imagination and enchant the spirit.